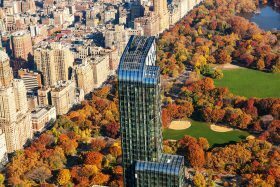 Founder and CEO of Dell Technologies, Michael Dell, was revealed as the buyer of the sprawling penthouse at One57 for $100.47 million, the most expensive home ever sold in New York City. According to the Wall Street Journal, Dell first entered a contract to buy the unit in 2012 when the Billionaires’ Row building, located at 157 West 57th Street, was still under construction. He closed the transaction through a limited liability company in 2014.